I have lectured extensively, on the podcast and in person, on the necessity of a PEEP valve to make a BVM work properly. It is part of the Ultimate BVM and allows for Apneic CPAP (you know the technique that would have made apneic ox actually work in the sick patients in the Fellow Trial). You can find extensive discussion of Apneic CPAP and why you need a nasal cannula to turn the BVM/PEEP Valve from low-flow CPAP to high-flow CPAP (you want high-flow CPAP) on the EMCrit PreOx Page. You can see the EMCrit video on this concept of Apneic CPAP from 2011. Friend to the show, George Kovacs, demonstrates these concepts beautifully and succinctly in the above cadaver video. Scott Weingart. Apneic CPAP Recruitment Demonstration by George Kovacs. EMCrit Blog. Published on December 13, 2015. Accessed on April 22nd 2019. 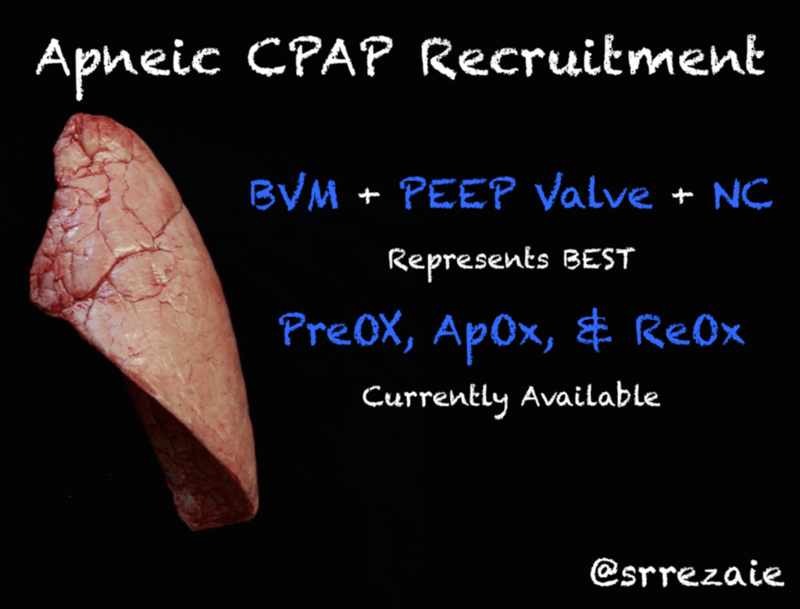 Available at [https://emcrit.org/emcrit/apneic-cpap-recruitment-demonstration-george-kovacs/ ]. Excellent video. Hard to argue the dramatic difference noted with PEEP vs No PEEP. Cool!!! Dramatic difference… Not seeing how this is better than breathing for the PT with a PEEP valve at a particular rate. What was the purpose of the video other than showing the dramatic difference between PEEP and no PEEP. What am I missing here? Could the same thing be accomplished with a well-sealed NIV mask with a nasal cannula at 15+ LPM on underneath it? Have done that with patients who fail BiPAP/CPAP and it has worked pretty well- even keeping it on during the apenic period. absolutely! and this is the way we originally recommended. Just additional task complexity with the NIPPV machine taking up space. Excellent video! When the operator is not bagging, does the BVM (provided it has a one-way inspiratory duckbill valve) provide any of the flow of O2? (Perhaps all BVMs have one-way duck bill valves now, at least that’s all we have in our hospitals). I was under the impression the only way O2 flows out the business end of a BVM is if you have a perfect seal and good negative pressure from the patient or the operator bagging. Otherwise all the O2 from the BVM will go out the exhaust port near the reservoir that prevents overfilling of the bag. For the sake of understanding the concept better; If you were to disconnect the BVM w/ PEEP valve from the oxygen source during apneic oxygenation but continued with a good two-handed seal with jaw thrust and had the nasal cannula running at 25LPM, wouldn’t you achieve the same degree of lung inflation? This could be very helpful if you had only one oxygen source. Thanks for your time. also, not sure what you are referring to as duckbill–important to understand all bags have one between bag and mask, question to know if your bag is good enough is whether there is valve at exhalation port. I saw the question from Wes and wanted to add that Chrimes and I tested if a standard Laerdal BVM with duckbill valve will provide some flow out towards the patient end if the reservoir bag was full. Yes it does, with everything inflated and 15L/min still inflating the BVM, you get about 4-5L/min out of the mask end of the BVM. Awesome video demo by George. Scott- are you using this technique routinely in place of just standard NC “ApOx” for the hypoxemic patient with shunt physio during the apneic period (if choosing RSI) ? Do we have any data supporting the utility of Apenic PEEP? Interesting point brought up by Wes that during apnea those 25 L via BVM shouldn’t really be having any effect, since there is no positive (bag) or negative (inspiratory) pressure to open the valve. Minh seems to indicate you do still get some flow… it makes sense there would be a threshold of continuous flow that would be great enough to open the valve, but this is the first I’ve heard of this..
Sure. As I know you would have too, would have loved to see Apneic CPAP performed from apnea onset to laryngoscope entry in the Fellow Trial. Even if Apneic CPAP is used in conjunction with ApOx in shunt physio folks, we still lose ApOx at the time of laryngoscope entry(due to impossibility of maintaining apneic cpap) . From this point forward, it’s just ApOx (w/out maintenance of recruitment), & this is probably of little utility. This all makes perfect sense, but I just wonder if ApOx + Apneic CPAP from the time of apnea to laryngoscope entry, is enough to make a clinical difference. I have a feeling one day we will soon find out. Where I believe folks get confused is when inadequate denitrogenation occurs and reliance on ApOx is used as a technique to compensate. This often fails and makes perfect physiological sense.. I see the future improvement in Emergency department and even prehospital RSI is to adopt more and more the techniques/gear of anaesthesia and by this I mean end tidal oxygen monitoring. We have adopted capnography and next step is the end tidal gas monitoring. Its not going to be difficult to adopt this next level of monitoring and it will give us exact precision in our preoxygenation for any situation. My current transport ventilator has built in capnography so the technology is already ready to do the next level.